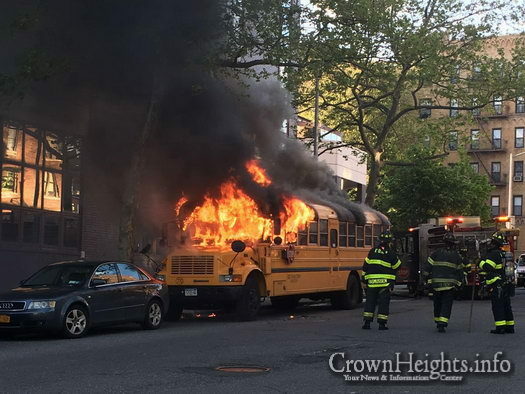 One day after four more juveniles were arrested for setting fire to a school bus parked in front of a Crown Heights Jewish girls’ school, the NYPD has dropped hate crime charges against all of the young arsonists. A total of five children and teens were arrested in connection with the incident, which occurred in front of Bais Rivkah on Lefferts Avenue. 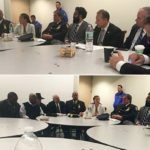 The Wall Street Journal reported that the decision to drop the hate crime charges was made after a meeting between police and lawyers for the five boys, who range in age between 11 and 14 years old. 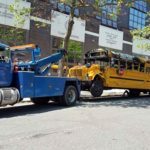 Police had originally classified the incident as a bias crime because at least one of the boys said that he knew the bus was affiliated a Jewish school when the fire was ignited and because it was the second time that Crown Heights’ Jewish community had been targeted in less than one week. 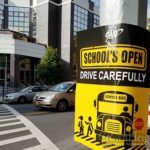 In the previous incident, a side view mirror of a school bus parked near a yeshiva was broken by a brick, although police said there was no evidence to prove that the two crimes were related. Each of the boys still face arson and criminal mischief charges and have been released to the custody of their parents. All five will be tried in Brooklyn Family Court. Where is our leadership to put pressure on the police? This so called “leadership” are only available to put pressure when it comes to arresting and charging fellow Jews. Reminder: a silly case of a mere squabble in 749 between Meshichist thugs and some of our great Shomrim volunteers, ended up in a six week trial, with the Shomrim Six facing up to 15 years prison. There was plenty of pressure then to prosecute the case. Do we have leadership here in CH? The police are araid they will be targeted!! destroying America, these people are! what do u think these kids will grow up to be????? Lock your bus and you won’t tempt kids to enter! It’s like leaving a stumbling block as a temptation. Oh yeah? Kick your kids in your house to avoid any temptations…. Only when crime occurs against blacks then it’s automatically classified as a hate crime. This is not true. Prosecutors can’t just slap a “hate crime” label on a charge because they feel like it. If they want a sentence enhancement because the crime was motivated by hatred they have to prove that to the jury. If they can’t do that, because the evidence simply doesn’t show it, then it would be unethical to try anyway just to make the community happy. um with all due respect what message are we giving them? They damaged a piece of someones property! Come on where is the justice???????????? Yes, they damaged property and they are being charged with that. What more do you want? What makes you think it was motivated by anything more than the common youthful love of vandalism and destruction? more of the same,, lets get some photo ops! Can’t expect more in this community/city. I’m sorry, but these are kids! 11 and 12 yr olds cannot and should not be charged with a hate crime. Why not? Do you think 11-year-olds can’t be antisemites?! If the evidence shows that their crime was motivated by hatred, then why should they not get the sentence enhancement that the law provides? In this case it seems that the evidence doesn’t show it, which is why they’re being charged only with what they did, not with their motive. But where the evidence does support a “hate crime” enhancement the age of the accused shouldn’t be an issue. Suppose that (c”v!) a Yid were to be arrested for vandalizing or destroying property of, say, the NAACP or the Rev. Al. And suppose that upon questioning it came out that the Yid knew that the destroyed property was affiliated with an African-American person or organization. Would African-Americans really just sit back and have no comment if said Yid were not charged with a hate crime? Would African-Americans be content with the Yid merely being charged with “arson and criminal mischief charges”? AND, if said Yid were released to the custody of parents or family, would this Yid truly be just as safe walking down the street as any other Yid is? These are unpleasant questions, but their answers show a double-standard. I am guessing that the original hate crime charges against those arrested, in this case, were based on way more than what is stated above. And I am guessing that the “meeting between police and lawyers for the five boys” included some threats of rioting and/or further violence against Jewish targets, so the police downgraded the charges. Well, let’s at least hope that the owner of the bus is awarded damages. But of course that would take a separate civil suit for damages, by the owner of the bus. So I hope the owner sues, and is awarded not only full damages, but also the costs associated with having to file suit for damages. But Hashem knows the truth about this crime. Your long rant is based on nothing but supposition and speculation. How do you know that if the races were reversed the DA would not treat it in exactly the way? What basis do you have for your claim that he wouldn’t? THIS IS NOT NORMAL, WHAT WILL THEY DO NEXT ?? The kids would be found not guilty & all the other charges will be dropped too. This way they will be sentenced for something. However, they should make restitution to the owners of the bus. “Hate crime” is not a separate charge, and they can’t be found not guilty of it. The jury woudln’t even be asked what they thought of the motivation until after they’d already found them guilty of the actual crime. Once the jury says the defendants did it, only then would they be asked why they did it, and whether they deserve an enhanced sentence because of it. If this is not a demonstration of a Hate Crime, what is? What makes you think they were motivated by hatred? Wrong info! The bus was moving on the road and with students!!! Will these preps receive more then the token slap on the hand and whaat will be the message to the communities and their parents? It’s the DA that drops the charges, not the police. But I do hate the legal system. Once upon a (long forgotten) time, long ago, every one of these vandals would have been sent to reform school (yes, they still exist, but only for parents who want to take control and are willing to pay $30K+/year). Google reform schools NY. Today, they get sent home to Mommy. If she couldn’t control him before, why does anyone think she will control her child now, especially if he learned that “YOU CAN BURN A BUS, GET A FREE RIDE TO THE STATION HOUSE, GET A FREE DINNER, AND THEN GO HOME AGAIN”! BRING BACK CORPORAL PUNISHMENT. Maybe then these juvenile delinquents will think twice before causing more damage. Prison laws have evolved significantly over the centuries. In some ways, the punishments have become lighter and in other ways they’ve become harsher. One law that’s been developed over time is the “Three Strikes” statute, which is a major prison legislation in several states, primarily California. A serious felony usually refers to heavy involvement with the illegal drug trade. The state of Washington was the first state to put this law into action, and since that time, several other states have adopted the law, including California, which is currently the state with the harshest punishments for this law. How Does It Affect Youth? In most cases, the Three Strikes law applies to adult felons, but there are some instances in which youth can be subject to life in prison. In 1997, California’s supreme court ruled that when a juvenile 16 years old or older commits a serious crime, it can count towards the three strikes allotted before a sentence for life in prison. Very rarely will a juvenile be put in prison for life, but the strikes given to them in their youth can count against them in adulthood. That means if they’ve committed two serious crimes in their youth, only one more in adulthood will put them in prison for life. These crimes can be anything from assault with a deadly weapon to murder. How Can You Protect Your Teens? The first step in protecting your teenagers from committing serious offenses that can put them in prison for life is first recognizing the problem. Teens who spend time with the wrong crowd, get involved with drugs, play extensive amounts of video games, don’t communicate with their family, and get in trouble at school are at a higher risk for committing crimes as a youth and an adult. If your teen has an addiction to a substance, video games, or another behavior, you may need to send him or her to a certified treatment program that can work with your teen to diagnose the issue and prescribe a recovery plan. Intervention is an essential step to keeping your teens out of trouble and helping them begin a new, positive path for change. Isn’t it the district attorney’s office that files charges, not the police? That’s where pressure needs to be applied. If they were Jewish kids burning a black bus they would never drop the hate crime charges! THIS IS RIDICULOUS!!! Is it pure coincidence that it was a Jewish-run bus? This was probably a crime of opportunity. These delinquents would likely have done the same if they had come across any school bus that was available. The charge should be vandalism/property damage, etc…. If this is not a hate crime…then what is? CHJCC get ur act together!!!!!!!!!!!!!!!!!!!!!!!!!!!!! !